When researching the American Revolution, we obviously hear a lot about the British. We also tend to get a lot of information about the French. The French sent us supplies. French officers led our troops. France’s Navy helped blockade the British and win the war at Yorktown. With all of the information about Britain and France we hear, it is easy to forget the other major world power involved in the American Revolution…Spain. Although Spain had been overtaken by Britain as the world’s most powerful Navy, they still had massive land holdings (and influence) around the world. Most importantly, to the American Revolutionaries, Spain controlled the Mississippi River and the Port of New Orleans. The decisions made by Spain would easily sway the war to whichever side they chose. Fortunately, they chose to side with the rebels. The Governor of Louisiana, Bernardo de Galvez, was tasked with assisting the Patriots. This is his story. Galvez, a nobleman, was well educated and trained in the military sciences. He had fought bravely in Europe, Africa and North America before, at just 32, being appointed Governor of Louisiana. This appointment came less than a year after the Declaration of Independence was published and part of Galvez’s duty was to (secretly) deal with the young nation. Since Spain was hesitant to start a war with Britain, they could not outright support the Americans. Galvez, for his part, sent the Patriots military supplies and granted them access to the Mississippi. He also prevented the Redcoats from accessing both the River and the Port of New Orleans. Since the British had blockaded American ports, the French had trouble getting their supplies to the Americans. Galvez’s goods proved vital to the Patriot Cause. When, in 1779, Spain officially declared war on Britain, Galvez stormed into action. Bernardo quickly attacked British ports in Florida. Florida, which had been Spanish until the French and Indian War, was taken back by Galvez. Now that Spain had control of the Mississippi and Florida, the British could only attack the United States from the north through Canada or from the east by the Atlantic. This allowed the Continental Army to focus its troops and was instrumental in winning the Revolutionary War. Galvez then brought his army to invade British held islands in the Caribbean. This not only added a distraction to the British Navy (forcing them to relocate ships) but also slowed their ability to supply their soldiers. Not long after the Revolutionary War concluded, Galvez’s father passed away. Bernardo took over his fathers position as Viceroy of New Spain. This position, in essence, made him President of Mexico. When Galvez received the promotion to Viceroy, his relevance to the American Cause came to an end. However, he deserves a massive amount of credit for his much overlooked assistance to the United States. The supplies he gave, trade routes he opened up, and men he led into battle were necessary to win the American Revolution. Without him, today's globe may look very different. In December of 2014, the United States Congress came together on a bi-partisan issue (yeah, I know the idea of partisanship in modern politics sounds crazy, but it's true). Congress awarded Bernardo de Galvez Honorary Citizenship of the United States of America. He is only the 8th person in American history to be granted this status. With all he did to assist in create this nation, it is hard to argue that he does not deserve this special title. Galvez is different from many of the little known Founders I discuss on this site because he actually has a good amount of literature dedicated to his life. 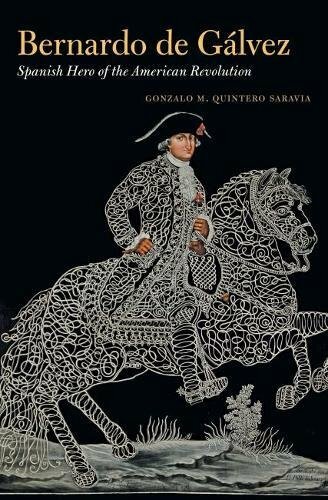 While I must admit I have not read all of his biographies, I recently finished 'Spanish Hero of the American Revolution' and really enjoyed it. I am embarrassed to say I never put too much consideration into what was taking place on the other side of the Mississippi but I am really glad I have a new point of view now. Check out 'Spanish Hero' from your local library or pick it up through our affiliate Amazon from the link below. And sign up for our email list if you haven't yet. You get a new Founder emailed to you every morning!